"If you want to get an idea of what the surface of Earth looked like at that time, you can just look at the surface of the Moon which is covered by a vast amount of large impact craters," says Professor Rais Latypov from the School of Geosciences of the University of the Witwatersrand in South Africa. The subsequent fate of these ancient, giant melt sheet remains, however, highly debatable. It has been argued that, on cooling, they may have crystallized back into magmatic bodies of the same, broadly basaltic composition. In this scenario, asteroid impacts are supposed to play no role in the formation of the Earth's early evolved crust. An alternative model suggests that these sheets may undergo large-scale chemical change to produce layered magmatic intrusions, such as the Bushveld Complex in South Africa.In this scenario, asteroid impacts may have played an important role in producing various igneous rocks in the early Earth's crust and therefore they may have contributedto its chemical evolution. "Our field and geochemical observations – especially the discovery of large discrete bodies of melanorites throughout the entire stratigraphy of the SIC – allowed us to reassess current models for the formation of the SIC and firmly conclude that its conspicuous magmatic stratigraphy is the result of large-scale fractional crystallization," says Latypov. 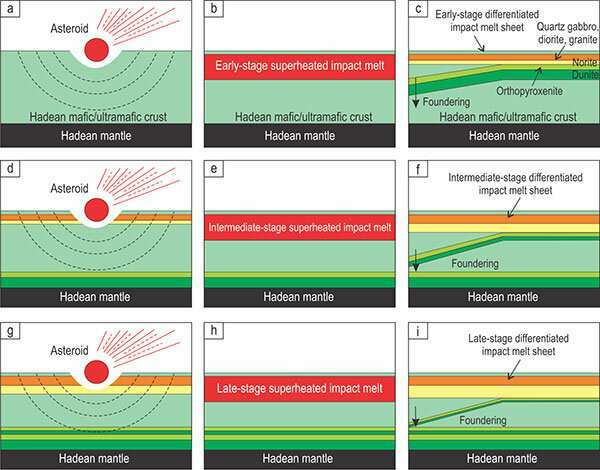 "An important implication is that more ancient and primitive Hadean impact melt sheets on the early Earth and other terrestrial planets would also have undergone near-surface, large-volume differentiation to produce compositionally stratified bodies. The detachment of dense primitive layers from these bodies and their sinking into the mantle would leave behind substantial volumes of evolved rocks (buoyant crustal blocks) in the Hadean crust. This would make the crust compositionally layered and increasingly more evolved from its base towards the Earth's surface." 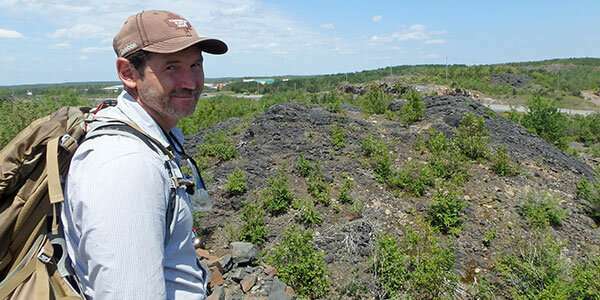 "These impacts made the crust compositionally more evolved – in other words, silica-rich in composition," says Latypov. "Traditionally, researchers believe that such silica-rich evolved rocks – which are essentially building buoyantblocks of our continents – can only be generated deep in the Earth, but we now argue that such blocks can be produced at new-surface conditions within impact melt pools."